See libraries with instruments (and other Library of Things) on our new scatter map! Have you considered adding musical instruments to your Library of Things, but don’t know where to start? Read below to learn from expert librarians across Massachusetts, and soon you will have your own noteworthy collection! As they develop their skills, your patrons will learn it’s more than books that make them sharp. If you’re lucky, some day one of your patrons may show off their skills at your library, like a guitarist who entertains book sale shoppers at Woods Hole with the library’s guitar! Cost is always a factor. Some libraries are lucky enough to receive instruments as donations from patrons. Others must allocate funds. That’s one of the reasons many libraries start their musical collection with ukuleles, which, ranging from $20-$80, cost less than an audiobook. Additionally, they take up less space and tend to be highly circulated. Patrons say they like them because they’re easy to learn and very portable. Sometimes they lead to expansion of your collection by inspiring local musicians to donate other instruments. Several libraries started with ukuleles as a test and ended up doubling their instrument collection after a massive response. Guitars are also in high demand by patrons. However, while many guitars cost barely more than a ukulele, they take up significantly more space, and finding an appropriate case for circulation is also difficult, so fewer libraries circulate them. Some libraries, however, are adventurous. 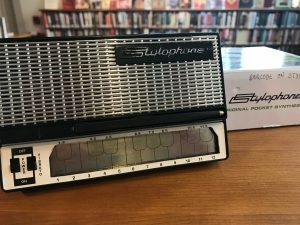 They can proudly declare there isn’t always silence in the library: with theremins for patrons to borrow, they can learn the Doctor Who theme, or take their own Trek into stardom! If you aren’t sure which musical instruments will drum up interest for your patrons, check out Northampton’s collection — with bongos, Djembe, and more, their patrons won’t be caught on a snare next time they want to attend a drum circle. At Duxbury, patrons can practically borrow their own marching band! Easy instruments such as bongos and keyboards also have a double use. You can add your instruments in to your programs, and suddenly your storytime becomes a Tale of Two Ditties! 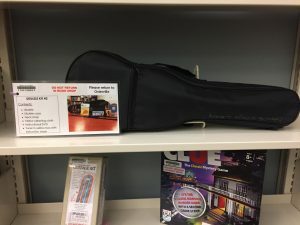 Several libraries use their instruments for programs, but Norwood warns that for classes you need to limit seats to the number you have, or tell people they have to BYOU (bring your own uke) after all the library-owned are reserved. Monson also recommends setting up ArtistWorks for patrons who want to learn how to play. With instruments, beginner’s books, and even classes available, you can tell your patrons they don’t need to feel like a chicken learning a new instrument! Dazzling and unusual instruments can attract interest too, such as Norwood’s guiro and afuche cabasa. However, unusual instruments can present challenges, as Amherst explains they had to remove their child sized violins because the strings kept breaking on tuning, and some obscure items may be expensive to tune. What to include with your instruments can also be a challenge. Do you include an instruction book, or use it as motivation to get patrons to explore your section on books of music? Some libraries, such as Newton, instead prefer to direct their bards to their books by creating a “Learn Section” in their Music Center. As for the shelf space demands, some libraries, such as Middleborough, display photo signs on the shelf and store instruments elsewhere. Signs also let you post your Policies before patrons bring it to check out. Other libraries, like Norwood, recommend shelving them to encourage impulse check outs (especially for children’s instruments). 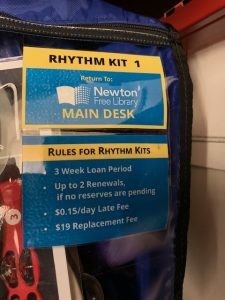 Policies on lending times and overdue fines vary, but one policy most libraries seem to agree on is these can’t go through Delivery, with very few exceptions (Norwood allows their cowbell, as it’s very sturdy). Some patrons may still attempt to return instruments at other libraries. You can deter this either by having a fine associated in large print if returned to the wrong library, or by making it clear if it is returned to the wrong library and damaged in transit, the patron is still responsible. Even with very responsible patrons, Northampton says there will probably be damage just from routine use, and recommends getting to know your local repair shop. Woods Hole reminds librarians to remove batteries from synthesizers, etc, before storing, as they can leak and cause damage. Osterville also warns that some surfaces are not sticker-friendly, causing your labels to fall right off, and offers the solution of laminating a card and tying it to the case. Greenfield Public Library recommends at least one staff member knows how to tune or maintain your instruments, lest you end up with patrons recounting their own tales of The Old Man and The C-way-too-sharp! Sadly, you’ll probably never be able to offer your patrons a chance to play their own Horn-Call of the Wild: at least unless someone invents some sort of rapid sterilization chamber, there isn’t much interest from librarians in adding wind instruments. Do you circulate musical instruments? Have questions for other librarians about circulating your own? Please comment below! Article by Laura M. Bogart, with contributions by Noreen O’Gara of Bedford Free Public Library; Jessica Phillips and Rose Hicky of Duxbury Free Library; Faith Kaufmann of Forbes Library Northampton; Lisa Prolman of Greenfield Public Library; Susan Andrews of Harvard Public Library; Diane M Ranney of Jonathan Bourne Public Library; Amy Anaya of Jones Library, Amherst; Barbara McNamara of Memorial Hall, Andover, Lori Salotto of Middleborough Public Library; Dani Scott or Monson Free Library; Lydia Sampson of Morrill Memorial Library, Norwood; Philip E. McNulty, Michelle Buglio, and Royce McGrath of Newton Free Library; John LeRoy of Osterville Village, Barnstable; Cindi Williams of Sawyer Free Library, Gloucester; Lucy Loomis of Sturgis Library, Barnstable; Lisa J. Arm of Wellesley Free Library; Kellie Porter of Woods Hole Library. This entry was posted in Library of Things and tagged library, musical instruments, musicians, non-traditional lending, ukuleles by laura. Bookmark the permalink.